In a quiet village surrounded by the imposing Italian Alps, a series of violent assaults take place. Police inspector and profiler Teresa Battaglia is called in when the first body is found, a naked man whose face has been disfigured and eyes gouged out. Soon more victims are discovered – all horrifically mutilated – and when a new-born baby is kidnapped, Teresa’s investigation becomes a race against the clock. The first absolute stand out feature of this book is the character of Teresa Battaglia herself, an older woman battling the twin issues of ageing and physical deterioration. Tuti paints a moving and incredibly touching portrait of this indomitable woman who caught up in an exceptionally distressing and seeming unsolvable case, is battling with her increasing concerns over her mental aptitude, recording her thoughts day by day feeling that they could slip away from her at any time, “what am I if not my thoughts, my memories, my dreams, my hopes for the future? What am I without these feelings, without my dignity?” These sections of the book where Battaglia unloads her consciousness into the written word are incredibly moving, brimming with a self-awareness, and a fluttering sense of mental fortitude that enthrals the reader, and says much about every person’s fear of losing their sense of self. Partly because of this, she over compensates in the tough exterior she is known for, not suffering fools gladly, and proving a hard taskmaster for her investigating team. The scenes that focus on her repartee with one of the newer members of her squad, who experiences no easy ride from his new boss are particularly barbed, but cut through with wit and a slowly developing sense of acceptance in a play on the pupil and mentor roles. She is, however, bestowed with a remarkable empathy for both victims and the killer saying at one point that “before crossing the point of no return, even a serial killer is a human being in pain. Often abused. Always lonely” which is incredibly prescient as the plot plays out. 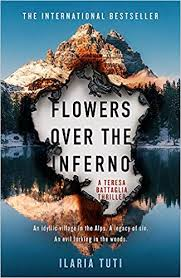 Tuti cleverly manipulates both Battaglia’s and the readers’ perception of the killer throughout, blurring the lines of moral responsibility, and with a real sense of there but for the grace of God. As regular readers of my reviews know, landscape is all important in my assessment and enjoyment of the books I read, and this small village overshadowed by forest and mountains in the Alpine region, works completely in harmony with the story. It’s an enclosed community, rife with secrets, and permeated with suspicion and folklore, producing a creepy and chilling backdrop to this murderous tale, “it was like the village had for many years been infected by a dark, tainted humour which had slipped beneath its surface, and festered there, out of sight.” The darkness, density and danger of the surrounding terrain, provides a place of both safety and threat for a group of children with difficult home lives, lending the story a touch of Stephen King who often employs children as a conduit for evil. It’s very effectively done, and really heightens the creeping sense of unease that permeates the book, and with the portrayal of the St Nicholas’ Day torch-lit procession evoking the evil figure of the Krampus, Tuti builds further on this theme of darkness and threat lurking in the shadows of this claustrophobic community. I think it’s fair to say that this book left a real impression in its wake on this reader, being not only a perfectly formed murder mystery, but also a book that is layered with a supreme awareness of the frailties and strengths of the human condition, through the investigators, the inhabitants of the village and the killer too. I found this a really intense and emotional reading experience, and felt utterly bound up in the lives of the characters, and the travails they experience. Absolutely highly recommended.